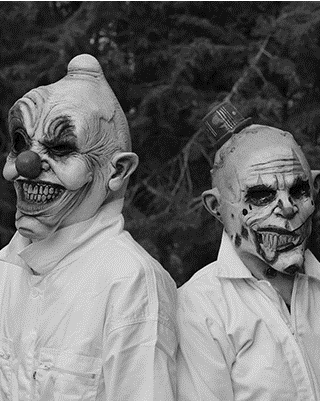 REBORN is a recent formation of rawstyle formed by two clowns whose identity is unknown and whose show does not leave anyone indifferent. It’s only been 1 year since its presentation and have already revolutionized the hardstyle scene in Spain. His first performance was at Fabrik (the biggest club in Spain), but have already gone through most outstanding clubs in Madrid as Pirandello 2, Marco Aldany or Industrial Copera (Granada). His first production, “Born to Hell ” its a really bomb. They are working at the second track. They have nominated this year to FHE hardstyle awards as the best rawstyle artist in spain and revelation artist and Vicius Music Awards the most important at The spanish Electronic music business.